The story of how the Mercedes-Benz 190E 2.3-16 came about – or the 190 Cosworth as it’s colloquially called – is well known, but it’s still worth repeating. In the early 1980s Mercedes decided its new small saloon, the 190, with its low-drag body and sophisticated multi-link rear suspension, would be the ideal base for a rally car to outfox the BDA-powered Ford Escorts and the Talbot Lotus Sunbeams that dominated rallying at the time. To give the 190E enough poke, Mercedes employed Cosworth to develop new parts for one of its cast-iron-block four-cylinder engine. The Northampton-based engineering firm designed a new head, and all the necessary equipment to go with it, to create a twin-cam 16-valve competition engine. As per the rules of the time, a homologated road-going version would be also need to be built to allow the rally car to be eligible to compete. Then Audi changed the whole face of rallying with its four-wheel-drive, turbocharged Quattro, rendering the rear-drive 190 Cosworth totally inadequate before it even had chance to kick up some dust or carve through some snow. Still, Mercedes persisted with the road car and launched the 190E 2.3-16 in 1983, but the Stuttgart firm retained its ambitions to turn its performance saloon into a competition car, only this time as a Group A touring car. In 1986 the 190E 2.3-16 made its first appearance in the German touring car championship, DTM. After winning two races in its inaugural year, a 190E campaigned by AMG helped Helmut Marko take the runner-up position in the championship. That started a decade of Mercedes competing and winning in DTM, the 190E duelling with the BMW E30 M3 for outright wins until both cars were replaced in the early 1990s. The incredibly close and competitive racing between Mercedes and BMW during this time means that, for some, late ‘80s DTM ranks amongst the best touring car racing the world has ever seen. But even before the 190E banged, bashed and scraped its way through a DTM race, it had already had some on-track history. The more humble road cars were used for an invitational, one-make race to celebrate the opening of the new Grand Prix circuit at the Nürburgring in 1984. The road cars – with only a set of racing bucket seats and harnesses, a simple roll-cage, some lowering springs (-15mm) and a shorter final drive – were driven by a roster of then current and future racing legends. James Hunt was joined by Niki Lauda, Jacques Laffite, Alain Prost, Carlos Reutemann, Elio de Angelis, Stirling Moss, Keke Rosberg, John Surtees and, the eventual race winner and relative rookie, Ayrton Senna. The race is credited with being the moment Senna’s talents became clear to the world, but in actual fact he’d already won the British Formula 3 Championship and had raced in four Grands Prix before the Nürburgring opener, so he was hardly unfamiliar to racing fans. Still, even if it wasn’t the moment that cemented the Brazilian as one of the greats, the Rauchsilber (smoke silver) and Blauschwarz (blue-black) 190s – the only two colours the 2.3 Cosworth was available in – slid around the new circuit so gracefully in controlled four-wheel drifts that they instantly became racing legends. But even this wasn’t the first time the 190 Cosworth had grabbed headlines. In typical fashion for the Stuttgart firm, Mercedes wanted to prove the 16-valve’s durability as well as its performance, so in 1983 three 2.3-16s ran flat-out for eight days and nights at Nardo’s high-speed bowl in Italy, covering 50,000km at an average speed of 248kph and setting a new world record. Despite the F1 driver kudos, the world records and the DTM wins, the 190E Cosworth never quite made an impact on the performance car world like the BMW E30 M3 did. The Merc’s sober looks, convoluted name and more refined character meant that it didn’t have the cult following of the more raucous Beemer, but, arguably, it’s the Mercedes that’s a better all-rounder. The phrase ‘homologation special’ is almost always a guarantee of a spectacular road car, and that is definitely the case with the 16-valve 190E. Okay, so it may play second fiddle to the M3, but that doesn’t mean it isn’t blessed with good pace and a fine balance. Using the same basic chassis as the regular 190E, with its strut and separate spring suspension at the front and multi-link arrangement at the rear, the Cosworth version gets different damper and spring rates and also gains hydraulic self-levelling rear suspension, driven off a pump at the front of the engine. The same hydraulic pump powers the Cosworth’s optional ASD (Automatisches Sperrdifferential, or Automatic Locking Differential). A conventional plate LSD is standard, but the ASD takes things a step further. In regular driving it operates as an ordinary open diff, but when the car detects that one of the driven (rear) wheels is rotating at a higher speed than the non-driven (front) wheels, it assumes wheelspin is occurring and closes the clutch packs in the diff to lock the rear wheels together. It’s a system with many benefits, as it is ‘open’ on corner entry to help reduce the chance of understeer, then locked under power to improve traction. However, even though it’s fast-reacting for a 1980s system and is far preferable to any sort of power-cutting or brake-activating traction control, it doesn’t react as instantly as a purely mechanical system. The big difference between the road-going 2.3-16 and other 190Es is, of course, the engine. Building upon the cast-iron block from Mercedes’ 2.3-litre 8-valve engine, Cosworth made a new aluminium twin-cam 16-valve head, much as it had with Ford’s engines to create the BDA and later the YB. A new set of pistons were created to match the head, but Mercedes’ crank and rods were considered strong enough as they were. Bosch K-jetronic fuel injection is used for fuel delivery, while a twisting, tubular four-into-two manifold deals with exhaust gases. Right-hand-drive Cosworths have a slightly different exhaust manifold so as not to clash with the steering mechanism. It results in a slight reduction in engine performance, but, because it sits higher, it is more prominent under the bonnet so you can appreciate its beauty a little more easily. The 2.3-litre Cosworth engine produces 182bhp in it road-going guise, but race engines – with dry-sumped oil systems; cranks, rods and pistons made from more exotic materials; and less restrictive induction systems – made over 300bhp. As is fitting for a Mercedes of the era, the 190 Cosworth was a dignified and restrained-looking car, despite its homologation-special status. A small wing on the boot, tiny spats on the arches, and lower sills and bumpers, all in body colour, were all that set the 16-valve model apart from the regular saloon. All very subtle then; even the exhaust exit is hidden behind the rear bumper. In 1987 the Cosworth was updated. The engine was enlarged by increasing the stroke from 80.25 to 87.20mm, taking the total capacity to 2.5 litres. As a result, the updated car was named the 190E 2.5-16. As well as the longer stroke, a new crank, rods and pistons, along with reprofiled camshafts liberated an extra 22bhp and 4lb ft of torque, giving the bigger motor a total of 204bhp and 177lb ft. However, later cars with catalytic converters fitted – necessary for emission regulations in some territories at the time – dropped the power back down to 194bhp. 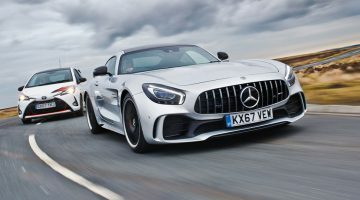 The aim for the updates to the 2.5 was to better align the Cosworth with Mercedes’ usual core values of luxury and sophistication. The greater performance meant the 2.5 could be fitted with a taller final drive than its predecessor (it went from 3.46:1 to 3.23:1) to make it a more competent cruiser. 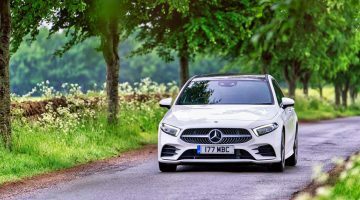 As well as the mechanical changes, Mercedes also redesigned the rear seats to increase rear passenger room by 20mm and reduced the size of the steering wheel by 10mm to improve legroom for the driver. The 2.5 was also available in two more colours: Astral Silver and Almandine Red. Just a year after the first Evo Cosworth, Mercedes launched the Evo II – again producing just 502 examples. It was yet more aggressive, with massive wheelarches, a huge adjustable rear wing, a prominent front splitter and a rear window cowl. This Evo, though, did get more power: the engine was much the same 2.5-litre unit as in the first Evo, but with a larger throttle body bumping maximum power up to 235bhp. The basis of the Evo and Evo II engines allowed the final race cars to have between 330bhp and 350bhp. It doesn’t take very long to recognise that the 190E Cosworth was built when Mercedes over-engineered its cars and really, deeply cared about build quality. There’s a solid clunk of the small door as you close it behind you, and the feel of the seats, the switches and the controls make it abundantly clear you’re in a 1980s Mercedes. But that doesn’t necessarily bode well for its performance characteristics: solid and heavy rarely translate to something fast and lively. But the engines are strong, and despite the rumours, the 2.3 feels torquey enough for a classic four-cylinder. It revs eagerly, too, but taking it right to its 7000rpm red line is a little taxing – it’s best change up at just after 6000rpm. What you aren’t treated to is much noise – it’s certainly more hushed road-car than barking DTM racer. There’s no tearing induction note to get you writhing in the leather seat in excitement, just a modest parp from the exhaust if you use lots of throttle and allow the engine to rev as high as you dare. The way the 190E sashays down a road is certainly very Mercedes, too. The ride is calm and relaxed, and there’s meaningful body roll as you spin the large steering wheel. But be a little bit more vigorous with your inputs, break through that initial softness, and the Cosworth shows its sporting credentials. The suspension is very progressive, so the harder you corner, the more support the body finds. Drive with enough pace to load the chassis and you discover a very neutral balance, incredible predictability and some genuine adjustability. It’s exactly what you’d expect from a front-engined, rear-wheel-drive sports saloon. Manual cars are worth slightly more than the automatics.